If you wish to personalize your Classic Elite Fountain Pen, Lanier will be more than happy to engrave the words or initials of your choice on your new instrument. Should you wish to add a little extra panache to the overall presentation, beautiful rosewood boxes are available for fountain pen storage as well. Beautiful, classic, and versatile, these pens are a wonderful example of fine form and function alike. 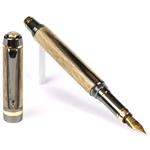 Straight lines and a tailored style characterize the Classic Elite Fountain Pen, which is easy to customize in many different ways to leave various impressions. The versatility of this model makes it a popular one for many of our bulk customers, and we invite you to peruse the various options and place your order as soon as possible! For a beautiful writing instrument featuring the sleek, sophisticated look of mid-century modern design, the Classic Elite Fountain Pen by Lanier is makes a perfect gift or collector's item. 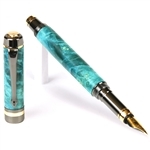 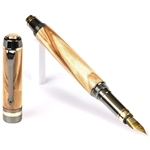 Made from rich, exotic, high-quality hardwoods, the body of this pen is set off perfectly by the metallic detailing in 22 kt gold and titanium - with beautiful black enamel accents. This is a terrific gift that can be customized in many different ways; an unusual color can leave a fun, offbeat impression, while a classic wood stain suggests a classy, mid-century executive style. A solid, medium-weight stylus that is well balanced for a wide variety of people and their everyday needs, the Classic Elite Fountain Pen comes with a precisely threaded cap that fits the end and the top of this instrument beautifully, making it easy to keep the pen in perfect working condition for many years to come. 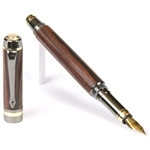 Indeed, this is a purchase that is sure to be treasured for its timeless elegance and smooth writing experience alike, lending an air of distinction to the desk and penmanship of any who are lucky enough to possess it.